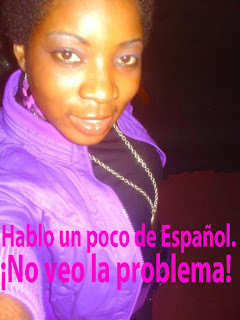 Naija American Girl: Naija American Girl....................speaks Spanish! You see, my parents, probably not consciously, didn't do the best job at teaching my sisters and I their native tongue, Igbo. Since we were all born in the U.S., we've had so much more exposure to English than Igbo. But we were raised in an environment where we learned a little bit of Igbo from Christian praise songs. There was even a woman who taught Igbo school on Saturdays for the children of Igbo immigrants that wanted their children to learn more Igbo. And of course there were the ongoing in-home lessons where our parents took teaching into their own hands. 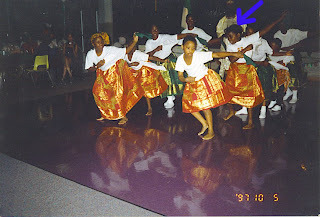 Performing with my Igbo school classmates at the tender age of 9. The blue arrow is pointing to me. Little by little, I've gained more appreciation of the culture which I was born into; it is my heritage, one that will be passed down for generations. If they taught Igbo in school, I would have surely taken it. But of course, they don't. French, German and Spanish were my only options in high school; I chose Spanish. From the first year of taking Spanish, I loved it. It just kinda clicked with me and it was always easy for me to learn the next concept or a new set of words. In high school I always seemed to have one Latino friend somewhere and my best friend to this day is Boricua (Puerto Rican). Plus, I've always had a little thing for Latino guys....... :) I took four semesters of Spanish in college and was even considering making it my minor. But when I found out how many extra classes I would have to take ( a year's worth) I decided to continue my education in Spanish on my own! So, I'm not ashamed to admit it: I know more Spanish than Igbo. I believe that having an understanding of as many cultures as possible makes for a more interesting and enlightened person. But I am a firm believer in exploring one's own culture first. Thus, I will continue my adventures in learning Igbo! And she speaks Spanish which is amazing of it all, ¡Perfecto! ¡Sí señorita, lo hablo, pero no es perfecto! ¡Gracias por leer mi blog! Don't sit with her. She's from Africa.